I love my platform bed, but there is no place to put the 2 drawers. I called . The mfr g about the problem and left a message I never heard back from Them. This was the only problem. The bed matched my other furniture very well. I would recommend the bed without the drawers. Enjoy the minimalist lifestyle with the Prepac queen platform bed. Offered in a deep black finish with optional under-bed drawers, this basic box design allows you to define the style of your bedroom. (Gray 4 drawers version) Took about 10 days after order to receive. The bed itself came in 2 boxes. Each set of 2 drawers came in separate boxes. We also bought a matching headboard, so we received 5 boxes in all, however each box was labeled with what it contained so there was no confusion as to which one we needed to open first. Bed itself is sturdy, but the stain seems to be veneer, so easily scratched down to a different color. Assembly was easy, but time-consuming. You need plenty of space in order to put it together. I also had trouble with the bolts in the direct center of the bed and had to get my partner to ratchet them firmer. You'll need your own tools to assemble. The drawers are made of crappier material with the exception of the front panels. Part of some of the backing actually crumbled apart while I was building the second drawer and I had to use wood glue to lock the section back into place. They are large and deep, but I would never put anything heavy inside of them, so forget books, magazines, etc. The drawers are free from the bed, so since there aren't any slides they can easily shift over so you have to be careful with them. I would recommend this bed for adult first time bed buyers like us. Do not think the bed will stand up to children and seriously doubt that the drawers would last long with anyone remotely rough with them. You can easily scratch them with your fingernails, so dogs will likely leave their mark too. The bed and drawers aren't bad, but they aren't top quality either. Good for us and others who want a neater way to store things under the bed. Definitely an upgrade from a metal frame and box spring, but might only last 5-10 years rather than 30. This is a nice bedframe with a sleek look; however, I think the price was way too high for the overall quality of the bed. The drawers don't necessarily slide smoothly as they aren't on individual tracks; however they are huge and can fit a lot. The wood slats don't like to stay in place. I am going to need to nail them down to make sure they stay. I did not purchase the assembly assistance thinking I could do it myself. I was wrong. Some of the holes did not line up. I ended up hiring someone to come put it all together, which was cheaper than the assembly assistance cost promoted when purchasing on this site. It took the guy almost 3 hours and he had power tools. I also purchased the headboard and thought they would provide hardware to connect the headboard to the frame, but they did not and I will have to go out and purchase screws to connect them myself. Overall it is a nice clean look and gets the job done. I just wish I did not pay as much as I did for it. My husband put this bed together by himself in about and hour and a half. It's beautiful, we got the grayish color and it works well with cool and warm tones in the room. If you put beige bedding on it brings out the brown and if you go with something cooler that color comes out as well. Very versatile. I like being able to pick the number of drawers as we put this bed in a corner and only needed two. the drawers are deep and wide and fit A LOT. My son wanted to put his jeans in one and sweatshirts in the other; they all fit in one with room to spare. Great piece especially for space saving and storage. The gray color looks way more expensive than it is. Love the bed and the color of the bed. The only thing I would say is a downfall is I had dings on it by the time the bed was down being put together. This platform bed was not that difficult to put together. I did not get the drawers, it looks ok. It is nice, since you do not need a box spring. I just got a really good mattress. 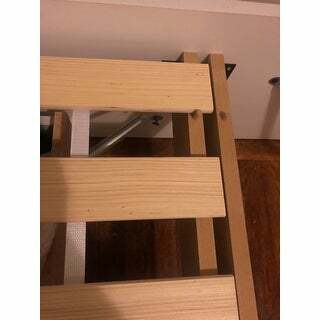 DO NOT PURCHASE....This was a poor quality bed frame, when putting it together some of the screws were too short, the wood that goes on the frame to holdup the box spring kept falling off when assembling had to screw in to secure with in 2 days of my son sleeping on the bed it broke. I took it apart and have to send it back but have no way of boxing it up so many pieces, long and short and very heavy.....this is a disaster and out a TON of money. Beautiful once put together. There were two of us and I think it took a total of 4 hours to assemble. Fits the queen bed perfectly, isn't too far off the ground and the drawers are huge! This bed was very easy to put together. My husband said that everything worked according to the way that it should. The only thing that I regret is that I didn’t get four drawers under the bed instead of two because I do have a space under the bed, but I guess it works out because now my cat has a place to hide. I will definitely order from this site again. I am very pleased with my product that I ordered and the short time it took to receive it. Most importantly, I was ablr to track my order with the information provided for the delivery. great price! Shipped fast! Super happy with my order! I really like how easy the bed was to assemble. I put it together in a few hours. "Is this just the bottom platform alone without the mattress correct ?" "Can you put an adjustable mattress base inside this base and eliminate the slats?" The bed has a central support for the mattresses. However, if you want to use the bed simply as a decorative surrounding with not weight placed on it, it could work. Any warranty claims would be void as you are using the bed in a way not intended. "What is the different between the bed with two drawers and the two drawers with wheels option? Does the first option just come with drawers that are not attached to the bed? " "Can I order this bed in a full size?" No, it is only available in queen or king sizes.	. Need storage! Reviewed as sturdy and easy to put together. I think the under storage is going to be great! "Are the drawers supported by mini wheels underneath them or are they supported by side tracks? It'd be great to see a picture of this detail. Thanks"
Yes, there are 5 caster wheels on each drawer. "Are the drawers difficult to pull out given they are not on a track?" No, there are 5 casters on the bottom of each drawer that make them roll very easily directly on the floor. However, if you have thick carpet, it may be a bit difficult.